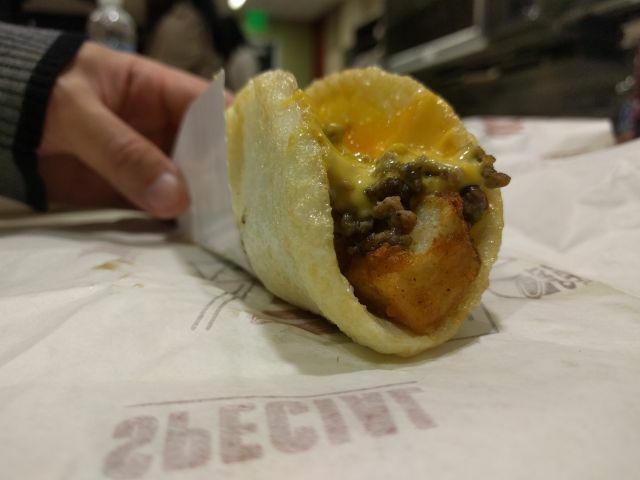 Taco Bell has already tried waffles, biscuits, and croissants as taco shells for their breakfast burrito so it shouldn't come as much of a surprise that they'll be testing a fried egg as a taco shell for breakfast in Flint, Michigan starting April 18, 2017. 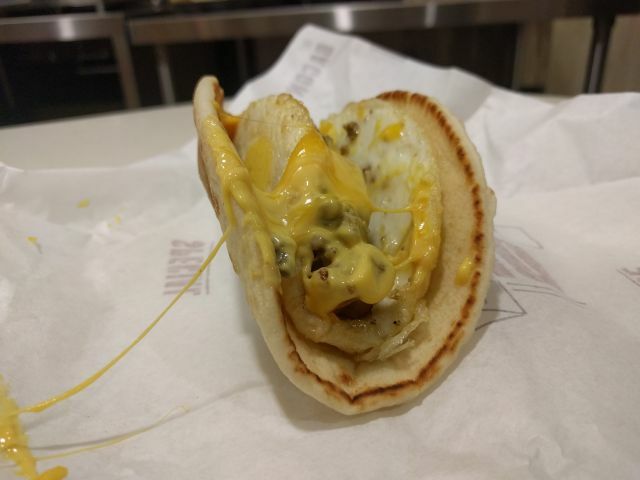 They're calling it the "Naked Breakfast Taco" and it features a shell that's literally a folded fried egg that can be filled with potato bites, sausage crumbles or bacon, nacho cheese sauce, and shredded cheddar. As long as you forego the potato bites, it should make for a pretty good option for a low-carb diet. For those who aren't ready to go "naked" there's also a "dressed" version that covers up the egg with a warm Gordita flatbread. I was able to try both versions at Taco Bell headquarters and it hits the classic breakfast flavors with an interesting form factor. The egg is fried so that the outside sports a thin crispy, bubbly crust and it holds together decently enough. That being said it might be a little too messy for portable eating as any liquid/grease just spills out since the egg can't absorb it the way that bread can. The Dressed Breakfast Taco actually tasted quite a bit differently even though it's the same but for the flatbread. During the test, both Naked and Dressed version of the breakfast taco will sell for $1.99 a piece. You can also get them in a combo that throws in coffee or a medium fountain drink plus two Cinnabon Delights or a hash brown patty for $3.99. First photo via Taco Bell; second and third photo by Brand Eating.